It was big news when Honda released a hatchback version of the 2017 Civic. The hatchback body style has not been available over here since 2005. The fourth generation Civic was a available from 1987-1991 as a sedan, coupe, hatchback, wagon, and a two seat CRX. The DX was the no frills model that this unfancy list of optional equipment: power steering, rear wash/wipe, clock, passenger door mirror, wheel covers, and auto transmission. What the Civic lacked in luxury features it made up for in driving fun and fuel economy. The 92 horsepower4 cyl SOHC engine only had 2165 lbs to haul around. 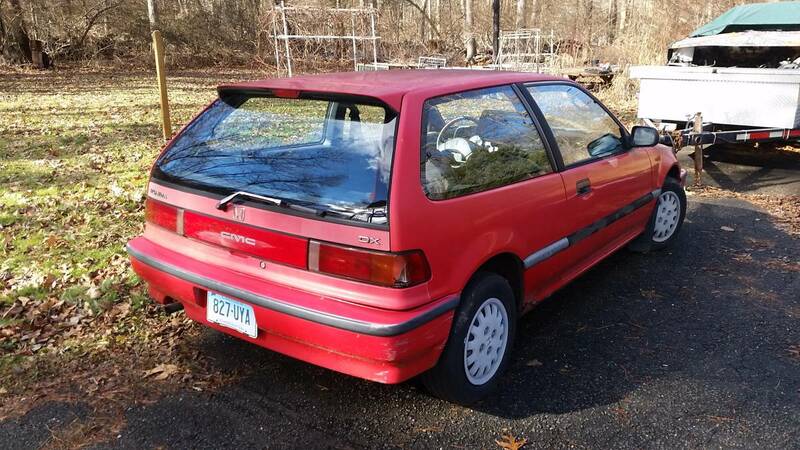 Find this 1991 Honda Civic hatch for sale in Westport, CT for $1,750 via craigslist. 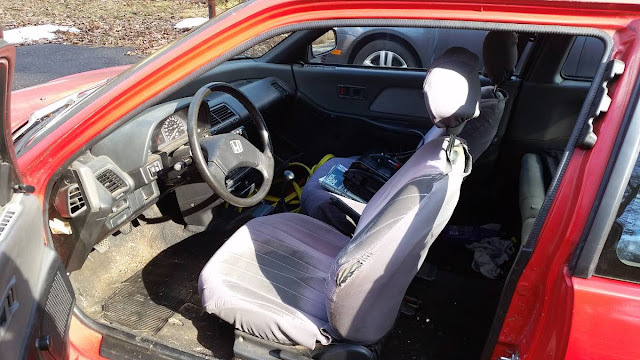 The car has been in the seller's family for over a decade. It was his father in law's daily driver for years before he stopped driving. It was a reliable car that hauled everything from groceries to dump runs. The car has 136,000 miles on it, but has not been driven daily in over a year. 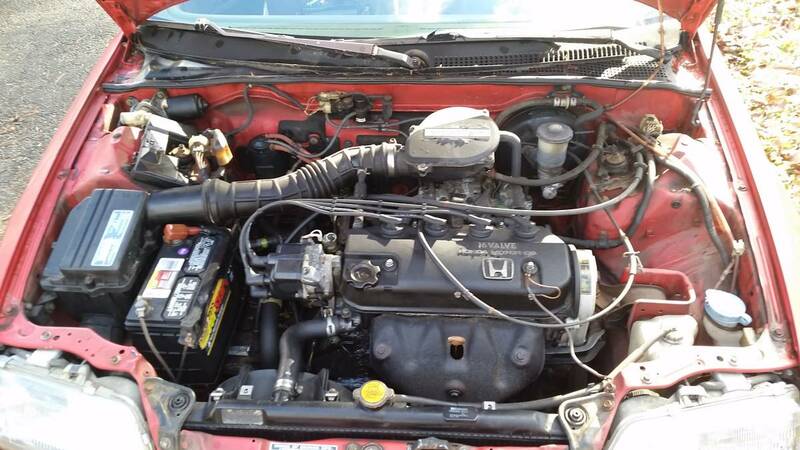 This DX model was rated at 29 mpg city and 32 mpg highway, but the seller reports mid 30s mpg. The battery is weak, but the seller notes last summer the distributor cap, coil, and rotor were all replaced. The seller goes on a mini-tirade about the car being bone stock and that it does not have a aluminum tow hook cover that he fancies all racer Civics have and even suggests if you buy the car you can then add one yourself. 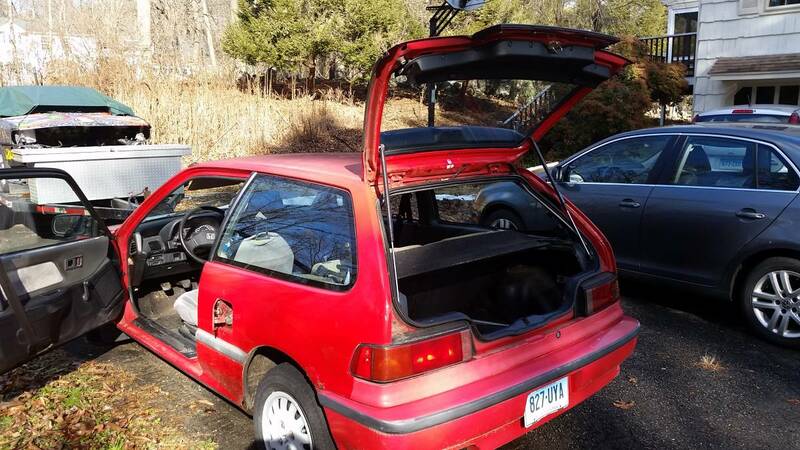 You could make a very entertaining commuter out of this hatch by delving into the myriad of available engine swaps, some suspension shopping at Ground Control, adding some lightweight 15" wheels, and a gauge cluster with a tach. Any other suggestions to make this cheap runabout more exciting? Bubble popper extraordinaire here... this one is not long for this world unless you replace the rear quarters from the inside out on both sides. That "light bubbling" of rust is typical northeast Honda Spot (TM) rust. That bubbling is all the way through and then some aft of the rear wheels, and fore of the rear wheels it's likely a goner as well. By the time you see the Honda Spot (TM) its already too late. Source? Anecdotes of owning Hondas (and having friends who own Hondas) in Maine for 20+ years. For an asking price of roughly what it would cost to buy and repair that rusty red one to an inspectable standard, you could have this rust free (but dented) example here in the middle of nowhere. Sadly, that one's an automatic. I learned to drive stick on one of these, owned by a girlfriend. An old, lightweight car is perfect to abuse the clutch on. If I drove automatic and wanted to make the leap to manual (or teach someone else), $1750 is a great price to get a fun little car to beat on until Robigo (the Roman god of rust) comes to claim his own.